Cisco Unified Computing System™ (Cisco UCS®) E-Series Servers bring data center-class, virtualization-ready blade servers to the branch office. Cisco UCS E-Series Servers are high-density, single-socket blade servers designed to balance simplicity, performance, and application density while operating in an energy-efficient environment. 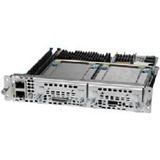 These powerful, small form-factor (SFF), x86 64-bit blade servers are housed within Cisco Integrated Services Routers Generation 2 (ISR G2) and Cisco 4451-X ISR networking platforms and are designed to host essential infrastructure services and mission-critical business applications in the lean branch office.